In case you find find programming computers a bit too tame, visit Backyard Brains and learn to program the brain of a cockroach. Backyard Brains sells kits to teach anyone the basic principles of neuroscience. In the past, experimenting with neuroscience meant working in a university setting, but with Backyard Brains’ kits, you can experiment with neuroscience at home. One of the more interesting neuroscience kits lets you control a cockroach. 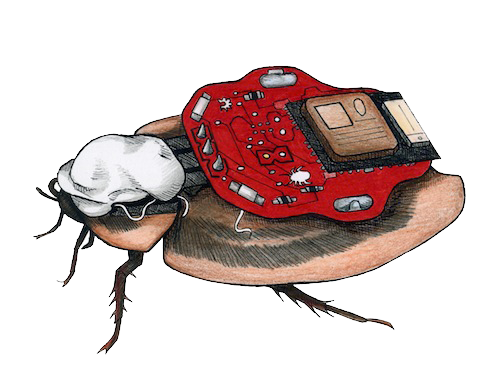 By wiring electrodes to a cockroach, you can control a cockroach’s movements like controlling a remote control car. If you thought cockroaches have no purpose, then you can experiment on a cockroach’s brain to see the basics of controlling animals electronically. The military wants to control insects as spies that can slip inside secure buildings without being detected. Other researchers are wiring up cockroaches and rats so they can control them to hunt out victims trapped in collapsed buildings caused by earthquakes or other disasters. By exploring neuroscience at home, you can learn how this new field has both pros and cons. Neuroscience represents a new potentially dangerous but also exciting field. If you’re curious about understanding the basics of neuroscience, grab a kit from Backyard Brains and start experimenting on some bugs. Best of all, programming a cockroach brings a new meaning to having a bug in your program that you can flush down the toilet when you no longer need it any more.